You haven't experienced state-of-the-art compact lifting convenience until you've used the BendPak SP7-XLF. This 7,000-lb.automotive lift comes loaded with a 63" top lift platform, equalization torsion bar, hardened pivot pins, dual hydraulic cylinders and ergonomic controls. Let the SP7-XLF take those vehicles, and your bottom line, to new heights. BendPak LR-4A optional arm kit available. Go ahead and just stand there! With the Bend Pak full rise scissors lifts you can be sure that your technicians will be more comfortable and much more productive. Not only that, many low profile vehicles are not a problem with the SP-7X. 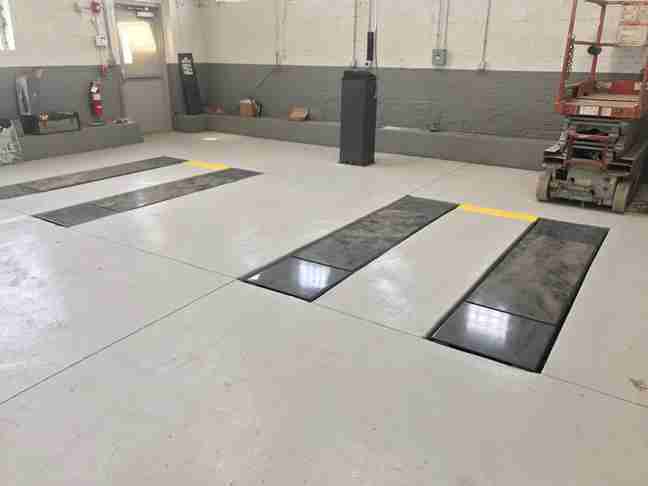 And with it's open center design, they will have full service capability.Whether you're refinishing a car, servicing brakes, rotating tires or performing general service work, these auto lifts will increase your shop's efficiency, and help make your job easier by offering a maximum lifting height of over 69". It's as simple as a push of a button. It's just plain good common sense that the quicker your work is done, the more jobs you can do.- And of course, the more money you can make. Also, the more shop space being utilized equals more profits as well.These lifts take up a minimum of floor space allowing more of your shop to be used. - It's just smart! When you need to add versatility and productivity to your shop or garage, your first stop should always be BendPak. The SP-7X is the mighty 7,000-lb., full-rise scissor lift that won't hog your precious floorspace and fits nicely into narrower bays. A frame engaging lift, it easily accommodates most passenger vehicles and light trucks and comes replete with pneumatic safety locks, rubber lifting blocks and an open center for full under-car accessibility. Always bet on BendPak for increased durability, safety and productivity. You aren't going find comparable quality or value anywhere else - BendPak always bests the rest. No cross member The SP-7XLF is installed and mounted flush into your flooring without a cross member. This makes for a true open-center design that provides access to all critical undercarriage areas without requiring operators to stoop or crawl across the floor. Plus, there's less drilling into concrete, because space will only need to be made for the scissor structures—no longer for a cross member. Reinforced steel at the base and along the top of the runways help provide a stable lift that completely eliminates the need for that cross member or additional structural support. Dual master hydraulic cylinder In order to push the frames out from a flush-mount position quickly and powerfully, the SP-7XLF is fitted with two hydraulic cylinders with flow restrictors to ensure an even lift. The controlled flow is sophisticated enough to prevent the risk of tipping, even if one cylinder loses pressure (due to an unlikely rupture or pinch, for instance). No emergency will result in the up-ending of your vehicle - the car lift would simply descend to the ground evenly on both frames. These lifts are exactly what we needed for our service bays. We keep them flush mounted with the floor surface, so they don't take up any room, which is perfect. Thank you for the guidance, and answering all our questions.